Meet John Haig. Nature lover. Survivor. US Border Patrol agent tasked with tracking down illegals in the wilderness between Canada and Minnesota. Ironically an unhealed wound stalks the tracker - Haig - every day of his life, until the morning he finds Sam Means' body, hurling Haig on a collision course with a pair of maniacs. One, a devilishly crazy assassin, named Dargov. The other, a psychopathic monster with an inferiority complex, named Zhmud. As Haig puts it, "It's a far cry easier to survive the elements than the human inhabitants." For four years he's managed to bury his anger over the murder of his ex-wife, an alcoholic woman with borderline personality disorder - a mental disease that rendered her lust for violent chaos. After finding the corpse of his old friend, Sam, at the foot of a waterfall on the US-Canada border, Haig resigns from his job, only to be pressured into an assignment to hunt down an eastern European assassin crossing illegally into the US. He jumps out a helicopter the next morning smack into a wilderness blizzard at the epicenter of a heinous Russian plot to capture a seemingly innocent child with a photographic memory and a mysterious disease. One twist follows another as Haig is forced to join forces with Dargov the nutcase assassin, surviving blizzards, a flood, Spetsnatz snipers, and Zhmud, the psycho who develops a hard on for Haig. Haig is further entangled when he discovers that the child, Stefan, is the son of Sara Novak, a Slovak nurse renting Haig's trailer home, and the only woman to arouse him since the death of his ex-wife. Slowly Haig uncovers a bizarre set of characters connecting the Chernobyl nuclear disaster to the ghosts of his past. Sara and other iron-willed women play their loony parts alongside a greedy native Ojibwa named Titus, suffering an identity crisis; Doc Olson, a retired military intelligence agent, now a wizened wildlife veterinarian; an alpha male wolf named Ulric; and a wayward polar bear named Napoleon. Join Haig as he is thrust into a whirlwind survival saga that begins at his cabin overlooking Lake Superior the moment he sits down in front of his television - with his favorite scotch and popcorn - to watch the event he’s waited for since childhood: The Cubs and the Yankees in the World Series. Wrigley Field, first game, first inning. Just as his electric shuts off. David Krikorian was a wilderness guide, jazz musician, great lakes boat pilot, an e-commerce marketing director, and the naturalist at Lutsen Resort. 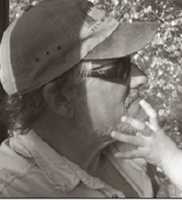 Krikorian has written for Field & Stream and Jazz.com. A former newspaper columnist, he now supports his inner novelist, working as a web content developer.